In a recent competition of nearly 300 water storage tanks, a legged tank in Destin, Florida, has been named the 2017 Tank of the Year. This annual contest sponsored by Tnemec Company, Inc., an industry-leading manufacturer of protective coatings and linings, showcased water tanks of all varieties from areas throughout the United States and Canada. 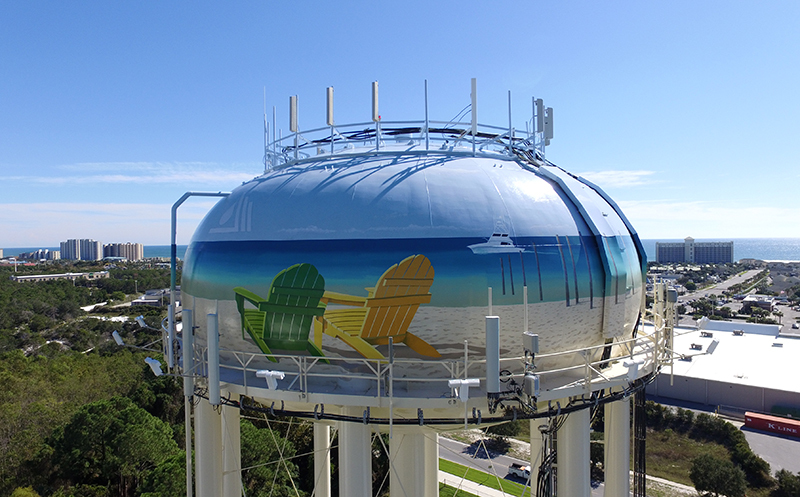 The award-winning design in Destin was created by a talented applicator and artist, Eric Henn, who worked with SUEZ Water Advanced Solutions, formally Utility Service Company, to paint the sky-high mural. Based in Dayton, Ohio, Henn travels all over the nation painting memorable murals on water and chemical storage tanks. The project team agreed that Henn’s design mimicked the tranquility and beauty of the local coastal landscape. The team made a few minor changes and then approved the mural’s graphic design. The owners consulted with SUEZ and they determined that the tank was eligible for an overcoat system. The existing coating was in good condition, but the owners wanted to create something more aesthetically pleasing. He utilized approximately 20 different colors of Tnemec’s fluoropolymer coating, Series 700. Series 700 has been applied to water storage tanks in coastal locations around the globe, from Kauai, Hawaii, to Hollywood, Florida, and showcases excellent long-term color and gloss retention. According to Henn, the mural took him two months to complete, working mostly during the day because of the tank’s location. The end result is a beach scene complete with two chairs in the sand, a few boats on the horizon and some familiar local plant life. According to Henn, the local utility has heard a lot of positive feedback since the water tank has been completed. Doug Hansen, Director – Water Tank Market with Tnemec, and a panel of fellow water tank enthusiasts chose Destin’s tank as the top-honor out of 12 finalists. The tank was selected by the group based on criteria such as artistic value, significance of the tank to the community and challenges encountered during the project. Other finalists included tanks in St. Cloud, Minn.; Eden Prairie, Minn.; Sunnyvale, Calif.; Port Arthur, Texas; Wichita, Kan.; Coopertown, Tenn.; Auburndale, Fla.; Lisle, Ill.; Paxton, Ill.; Wasaga Beach, Ontario, Canada; and Gaffney, S.C., which received the most votes during the online ballot period to earn the title of 2017 People’s Choice. Throughout the years, many of Henn’s other murals have been finalists or winners during the contest. Notable entries include the apple basket tank in Mount Jackson, Va.; the Emerald Coast elevated tank in Okaloosa Island, Fla.; the “clear” tank in Laurens, S.C.; and the Darree Fields sport complex elevated tank in Dublin, Ohio. Henn is already working on his next big project: a 21-million-gallon concrete tank in Nashville, Tennessee, utilizing Tnemec’s flexible and breathable waterborne acrylate, Series 156 Enviro-Crete. He estimates that this tank will be ready in time for next year’s Tank of the Year contest. 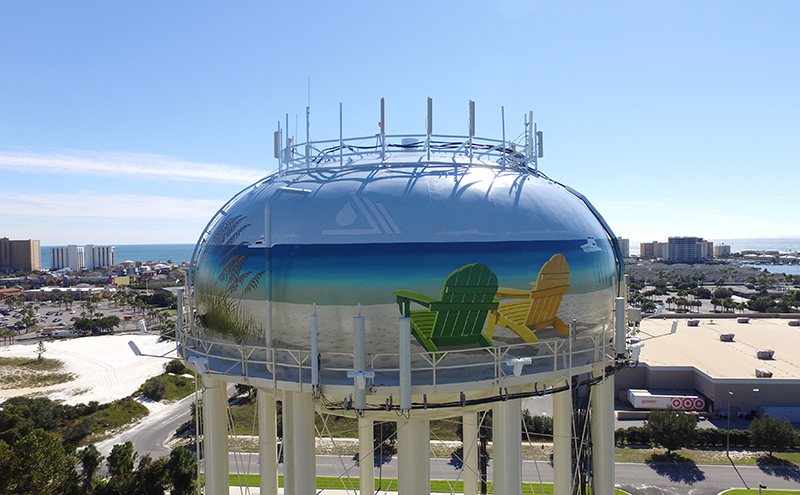 The beach-front water tank in Destin is one of four potable water tanks managed by Destin Water Users, Inc. Together the tanks have the capability to handle all peak hour and fire flow demands in the community.